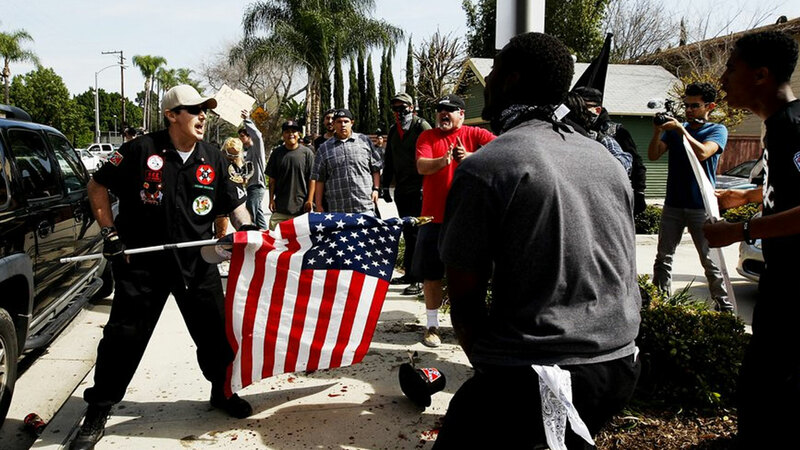 ANAHEIM, Calif. -- Dozens of protesters who heard about a planned Ku Klux Klan rally were waiting by a Southern California park when six people pulled up in a black SUV. They were dressed in black shirts decorated with the Klan cross and Confederate flag patches and took out signs that read "White Lives Matter." Witness video show the Klansmen were quickly surrounded Saturday afternoon by the counter-protesters who shouted at them. Someone smashed the SUV's window. One KKK member stabbed a counter-protester with the decorative end of a flag pole, setting off a vicious brawl where three people were stabbed, one critically, and two were assaulted. "I got stabbed," a man is then heard screaming, lifting his T-shirt to show a wound to his stomach. A fire hydrant where the man briefly sat was covered in blood. One police sergeant saw another Klan member with a knife in his hand and a counter-protester bleeding nearby, Anaheim Police Sgt. Daron Wyatt said. The sergeant took the KKK member into custody. Meanwhile, counter-protesters stomped on two KKK members, he said. "All hell broke loose," said Brian Levin, director of California State University, San Bernardino's Center for the Study of Hate and Extremism, who witnessed the violence. "I thought they were going to stomp these Klansmen to death." Anaheim police had notified the public about the planned KKK protest Friday at Pearson Park, about 3 miles from Disneyland, and said they would be monitoring the situation for any violations of law. The department also said that while the group's signs and fliers might be provocative, they are protected by the First Amendment. "I'm still kind of a little bit shaken by it," he said. "Preventing violent confrontations is always our goal; unfortunately the handful of individuals committed to criminal behavior this afternoon caused the violent episode," he said in a statement. "If we're attacked, we will attack back," said Barker, who did not attend the rally and spoke by phone from North Carolina. The organization lists Pelham, N.C., as its headquarters. Last year, the group drew headlines when it protested the removal of the Confederate flag from the South Carolina Capitol. Namdar said he was stunned to learn about the KKK's presence in his backyard. "It's pretty disturbing," he said. "I didn't know they were around this area."